Heat olive oil in a pan and add all the vegetables one by one in order of their tenderness and cook for 2-3 minutes stirring and mixing till they become tender and are not over cooked. Add salt and pepper and cook for another minute. Switch off the gas and add lemon juice and honey and serve. Mix all the ingredients of dhokla except for the meeta soda or eno. The batter has to be slightly thicker than the idli batter. Meanwhile add 3-4 cups water in the steamer and heat it. Grease a pan or idli mold with oil. Add the eno or meetha soda and mix it with a light hand. Quickly pour the batter in the prepared pan or idi mould. Keep the mould in the steamer. Cover the steamer and steam for approx 15-20 minutes. Check with a knife ,if the knife comes out clean, then the dhokla is ready. Remove the dhokla and allow to cool for 5-6 minutes. De-mould the dhokla carefully in a serving plate and then temper it. First add the mustard seeds then hing,curry leaves and then green chilies and stir a while and pour the tempering on the idli shaped dhoklas and mix well. If you are using a pan mould then pour the tempering on cooked dhokla after or before de-moulding it and then cut it into pieces. Serve hot with chuttney or sauce. 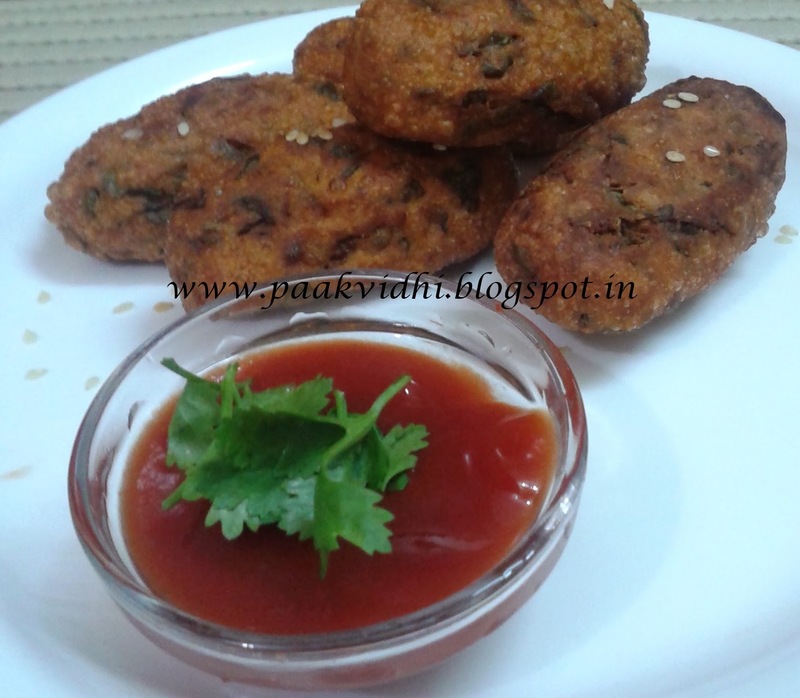 If idlis are big in size then cut them into 2 or 4 pieces and then add tempering. 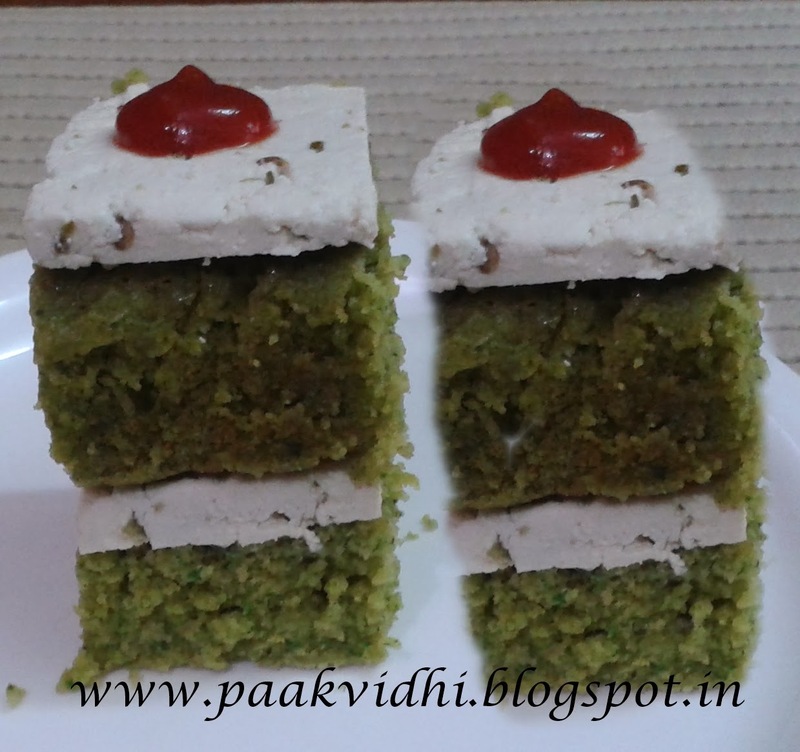 I have placed a slce of soya cheese in between two pieces of dhokla and placed one cheese slice on the top. When the seeds crackle, add the urad dal, curry leaves and green chilies,grated ginger and sauté on a medium flame for 1 minute, while stirring continuously. Add the asafoetida, and rice and mix well and cook on a slow flame for 1 to 2 minutes, while stirring continuously. Add the salt, mix well and cook on a slow flame for 1 minute. Serve hot along with curd and garnish with coriander. 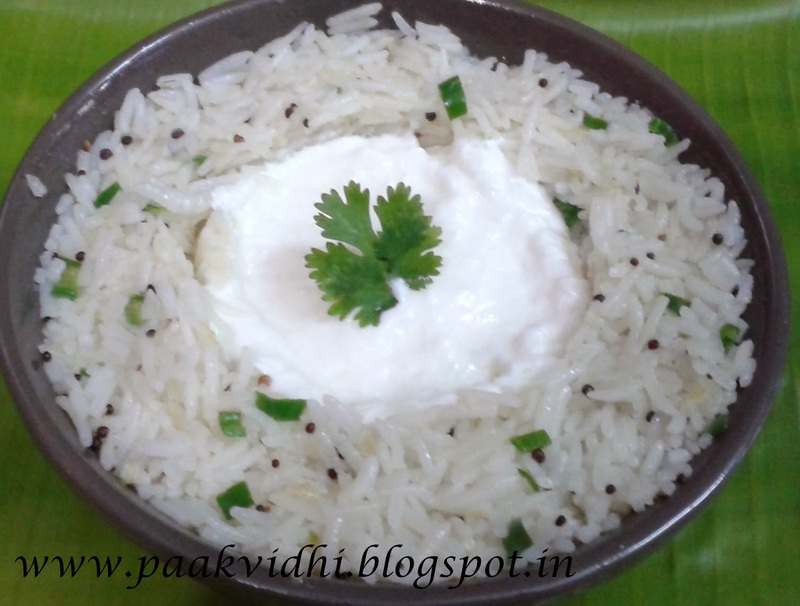 You can combine rice and curd together and then make a tempering of rest of the ingredients and pour the tempering on the mixure or cook the mixture in tempering for 1 to two minutes. Sieve the bajra and wash it with water.Soak for an hour and then drain out the water completely. Now put the bajra in a mortar (kundi sota, mam dasta ) and beat it so that all the husk wades off. Separate the husk from the bajra by tossing it.Repeat till almost all the husk is removed. Wash the ground bajra,moth dal,rice and moong dal together. Combine the bajra mixture and salt with 4 cups of water and pressure cook,simmer the gas after one whistle and cook on low flame for 30 minutes, when the pressure is released check whether the bajra is cooked. If required add more water and cook for another 20-30 minutes in pressure on low flame. Heat the ghee in a pan and add the cumin seeds,asafoetida grated ginger and chopped onion and cook til it becomes brown in color.Add degi mirch and garam masala and turn off the gas. Now pour this mixture over the cooked khichdi and mix well. Adjust the consistency of the khichdi at the time of serving by adding ½ cup of hot water if necessary. 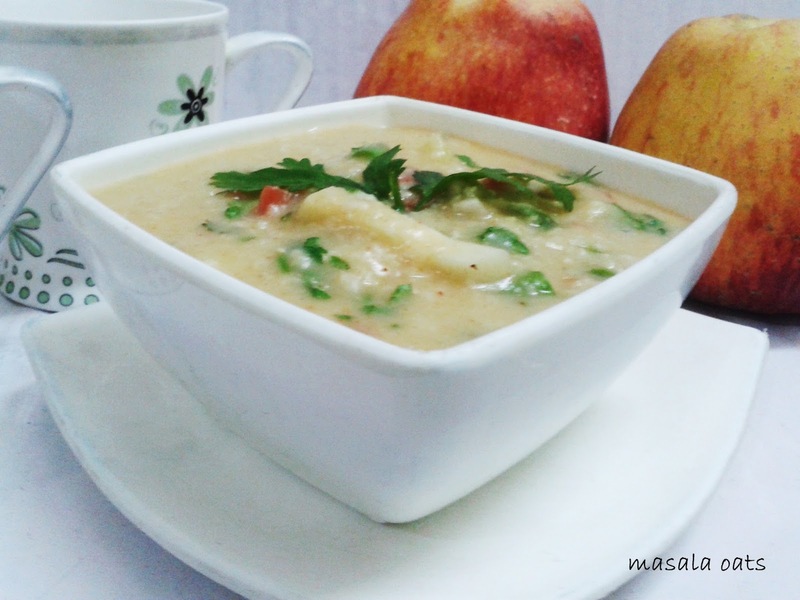 Serve hot with ghee, kadhi or curds. 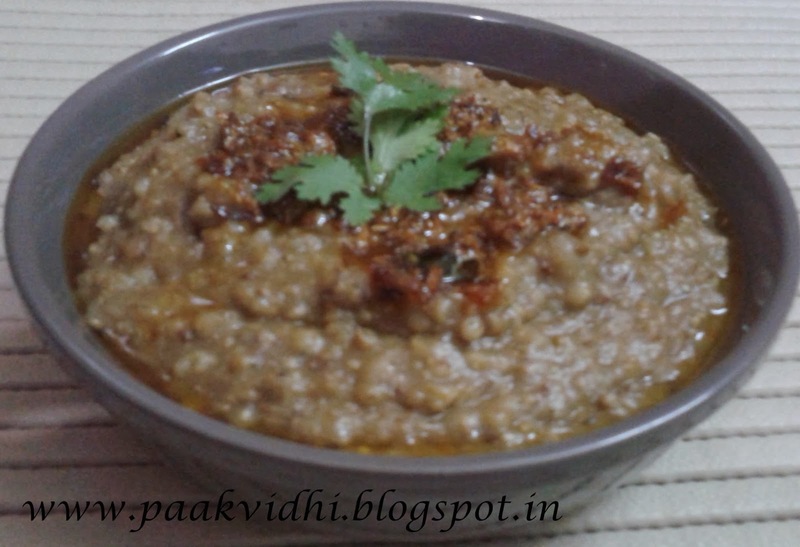 If you don't get moth dal then you can make it without it. Boil water in a pan switch off the gas and add broccoli,cauliflower,mushrooms, baby corn,peas,french beans and carrots to the boiling water,add a pinch of salt and cover the lid. Drain out the water after 3-4 minutes and keep the vegetables aside. Heat olive in a pan add all the bell peppers stir for a minute then add all the boiled vegetables ,add salt and black pepper. 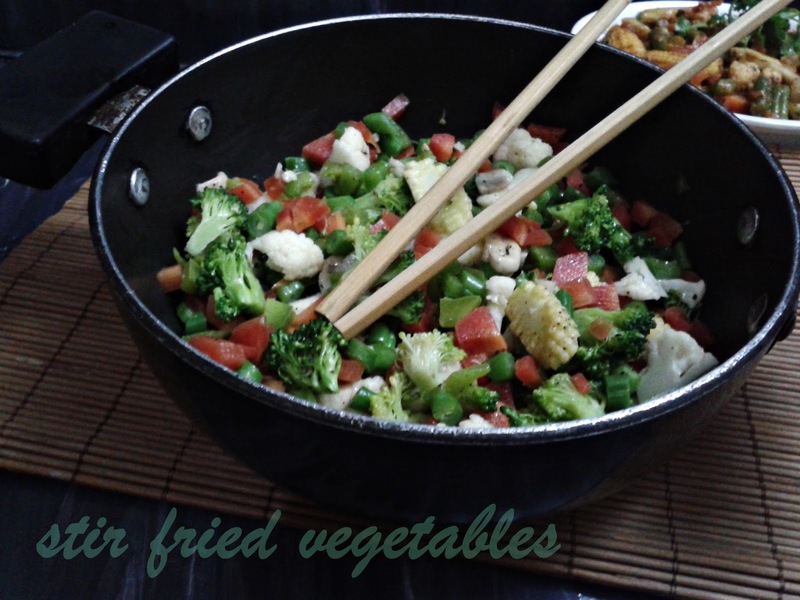 Stir fry all the vegetables till they become crisp and crunchy. 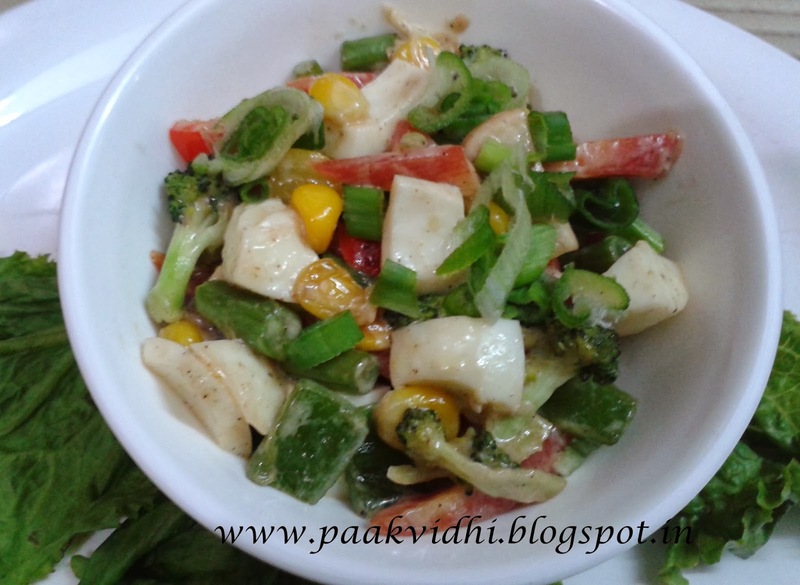 Cut the egg ,discard the egg yolk and chop the egg white , mix stir fried vegetables and mayonnaise. Garnish with spring onions and serve hot with toasted bread. 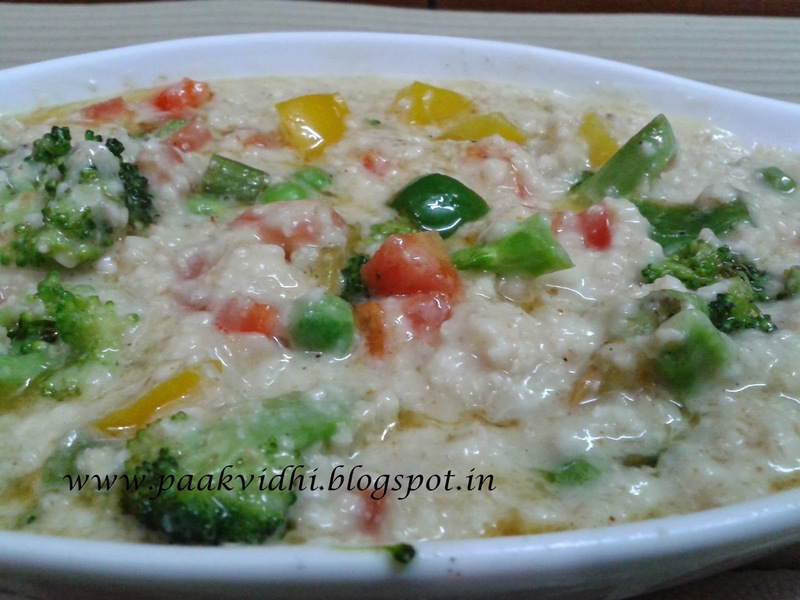 Boil 2 cups water in a pan add oats and cook for 3 minutes, add salt to taste , mix stir fried vegetables. Cut gobi into small floweretts and put it in boiling water adding 1/2 tsp salt .Keep it like that for five minutes, then drain the water and keep gobi aside. Mix all the ingredients except oil and chat masala in a bowl along with a little water to make a batter of coating consistency. Dip the gobi in the mixture and half- fry it in oil. Drain out and cut into halves and re-fry the pakoras till they become golden brown in color. Drain out on an absorbent paper and sprinkle the chaat masala. Garnish it with coriander leaves and serve hot with dhaniya chuttney,imli ki chuttney or ketchup. Adding cornflour and rice flour will make the pakoras crispy , if you are not using them then double the quantity of besan. Heat oil in a pan and add onions stir them till they become pink in color and add all the other vegetables. Add salt and cook the vegetables on medium flame under lid stirring occasionally for five minutes or till they become tender. Add oats and sabzi masala and pepper and stir for a minute. Add 2 cups of water and stir continuously till you reach the desired consistency.If required you can add more water. 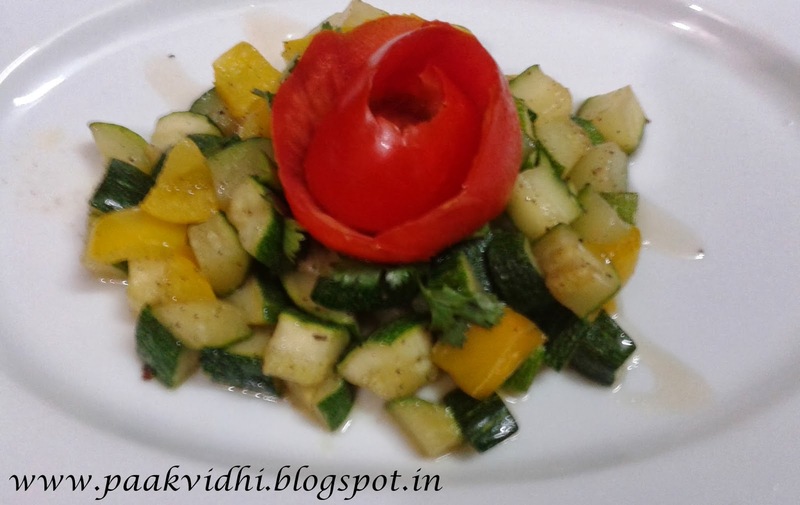 Garnish it with coriander leaves and serve hot with tomato ketchup. You can take the more or less vegetables as per your choice. Chop the mungras with hands by discarding its stem and the upper thin part. Wash them and put them in a mixer. Add remaining ingredients and coarsely grind it. The chuttney is ready to be served with dal- chapati or paranthas. Dry roast rava in a pan for 2 minutes. 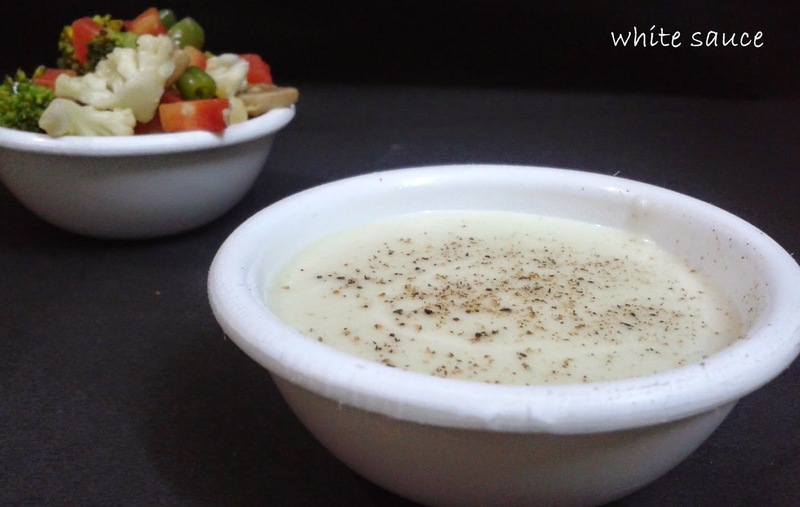 Mix roasted semolina, ginger and curd in a bowl , add water if required. Cover and keep aside to ferment for an hour. Add the salt and mix gently. Grease a non-stick pan with a tsp oil and pour a ladleful of batter and spread it in circular motion to make a not very thin pancake. 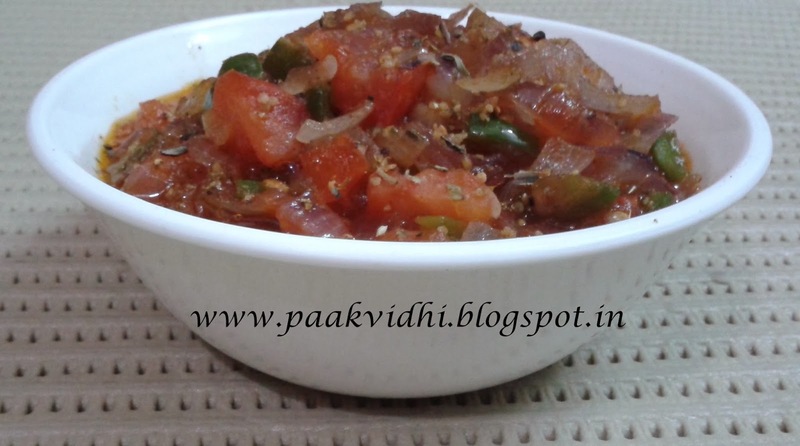 Top it with chopped onions, tomatoes, green chillies and coriander leaves. Cook from one side, using little oil, turn over and cook from the other side. 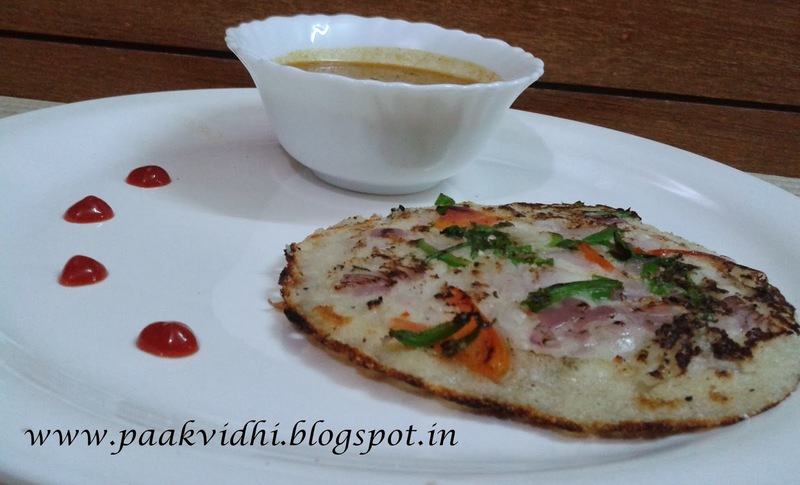 Repeat the process to make more such uttapams using the remaining batter. When cool take them out from the molds and keep aside. Heat oil in a pan and crackle mustard seeds then add curry leaves and peanuts and stir till the peanuts are cooked. Add green chili and onions stir them till they become light brown in color and add rest of the ingredients and then lightly toss idlis and stir till masala coats the idlis well. Heat oil and deep fry the muthia till golden brown in color. Grind the rice to a coarse paste. Bring milk to a boil. Add rice paste. Cook till rice is completely cooked, stirring constantly. Add sugar and cook till sugar is completely dissolved. Pour into a bowl and chill in a refrigerator for an hour. Add chopped strawberries to the cool phirni ,garnish with some sliced strawberries. Trimm off the edges of each slice of bread. Mix rest of the ingredients in a bowl except pizza pasta sauce or tomato ketchup. 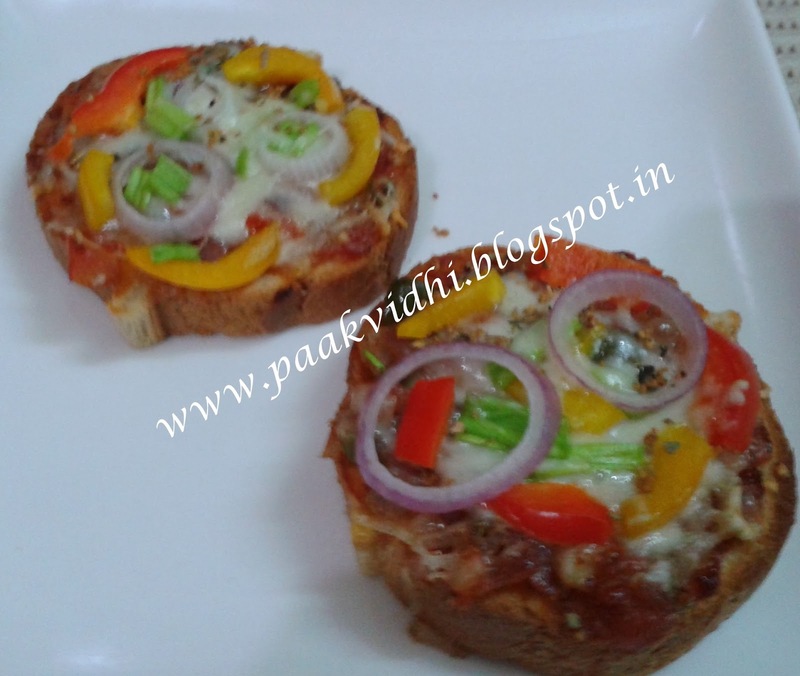 Spread pizza pasta sauce or tomato ketchup on each slice of bread. Cut these sandwhiches in the desired shape. You can grill it in an OTG or a griller or patty maker or you can simply roast it on a tava or a griddle pan. Heat butter in a pan and add washed corn kernels in it. Add salt and cook for 2-3 minutes. Switch off the gas and serve hot. Heat oil in a pan and add chopped onions,stir till they become pink in color. Add the flour and cook on a slow flame for a minute. Add the milk gradually and stir continually until the sauce thickens. veges of your choice like coloured bell peppers, onions, olives mushrooms etc. Spread pizza pasta sauce on one side then salsa sauce. Now add grated cheese and then the toppings. Bake in an oven at 180-200 C for 10 minutes or till the cheese melts and is brown in colour. Sprinkle mixed dried herbs and serve hot with sauce. Melt butter with the oil. Add the onion, celery and garlic and saute until soft and transparent. Add tomato sauce and tomato puree and stir until smooth. Simmer for 45 minutes stir occasionally. When it is cool keep it in a refrigerator in a container and use as and when required. Sieve the flour and salt together on a plate.Rub the butter into the flour with your fingers and mix well. Gradually add ice-cold water (approx. 3 tbsp) and knead well to make a stiff dough and refrigerate for at least 15 minutes. Knead the dough again, divide it into 10 equal portions. Roll out a portion of the dough into 4” diameter circle. Place the circle into a tart mould or tart case and press the circle gently around the sides of the mould. Place 4-5 rajmanh or any other pulse like chick peas in each tart. Repeat the process to make 9 more tarts. Arrange the tarts on a baking tray and bake in a pre-heated oven at 200ºc (400ºf) for approx. 10 to 15 minutes. Cool the tart cases and use as required. Place the tarts on a baking tray. Put the home made salsa sauce about a tea spoon in the tarts. Place the toppings on the tarts. Bake the tarts in a preheated oven for 5-10 minutes at 200 degrees C or till the cheese melts and become slightly brown in color. You can use a ready made tarts instead of making a them. You can use any other toppings as per taste. Greasing of tart moulds is not necessary, unless the moulds are new. Heat the oil in a pan or in a cooker on medium high heat. 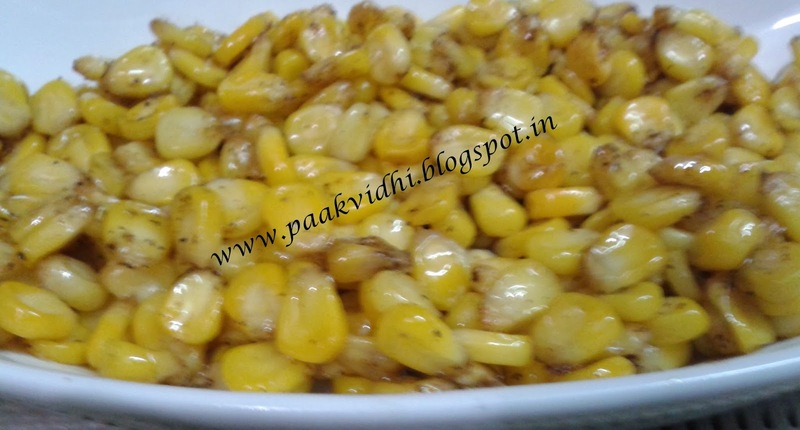 Put corn kernels into the oil and cover the pan or cooker without whistle. The popcorns will start popping soon, and all at once. Once the popping starts, gently shake the pan by moving it back and forth over the burner. Once the popping slows to several seconds between pops, remove the pan from the heat, remove the lid, and put the popcorns immediately into a wide bowl. If you are adding butter, you can easily melt it by placing the butter in the now empty, but hot pan.And when it melts pour it on the popcorns and shake them well. 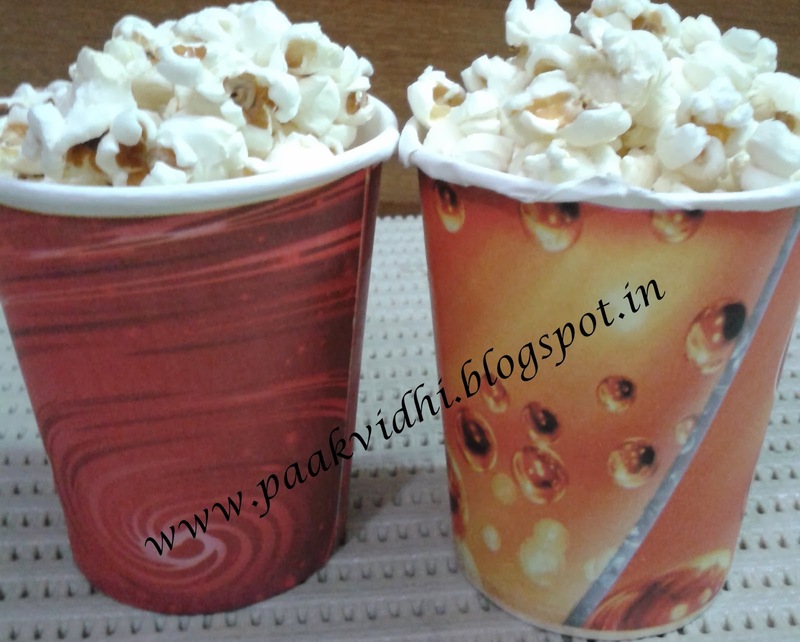 You will get dry corn kernels from a grocer's shop or in any super market. When they start to changing color and you hear a crackling sound switch off the gas and keep them aside to cool. Heat ghee in the pan and roast koya in it till it becomes dry,changes colour and leaves the sides of the pan. Now add ground sesame seeds,kaju tukra and bura sugar to it and mix well. Now make small balls by pressing the mixture tightly with your hand. Laddos are ready to be served. you can store them when they are completely cool for 10-12 days. Peel ,wash and cut the turnip into 1" cubes. Take oil in a pan and when it is hot add cumin seeds. When the cumin seeds start to splatter add chopped onions and ginger and cook till the onion becomes light brown. Now add green chilies, turnip, salt and turmeric powder. Add 1 cup of water and cover the pan with a lid. Check for the tenderness if required add more water and cook further till the turnip is almost done. Now add chopped tomatoes and rest of the spices and mix well. Add sugar and cook till the sugar melts completely. If you are using lemon then add its juice in last. Garnish with coriander leaves and serve hot with dal and chapati. Put them in a pressure cooker and add all the ingredients listed under saag except for maize flour. Cover the pressure cooker and after first whistle simmer the gas and cook for one to one and a half hour. When the pressure releases pour the maize flour dissolved in 1/2 cup of water in the boiled greens. Now with the help of a blender puree the saag and blend till smooth. Cook for another 25-30 minutes covered with a lid stirring occasionally. In another small pan, heat ghee add cumin seeds,asafoetida powder and the chopped onions and fry them till light brown. Add the tomato puree and cook for 2 minutes. Now add the prepared saag. stir and simmer for a couple of minutes ,stirring occasionally.Check for salt and if required add some more. Serve sarson ka saag hot with a dollop of butter on the saag with makki di roti and ghee shakkar. Heat ghee in a pan and add seviyan. Roast them in ghee till they start changing color,stirring continuously. Add water and cook on high flame till all the water evaporates and the seviyan are cooked. Add sugar and cook further on high flame for 3-4 minutes or till the water left by sugar also evaporates but not completely. Put a lid on the pan for 5 minutes and the remaining water will be absorbed in the seviyan by itself. 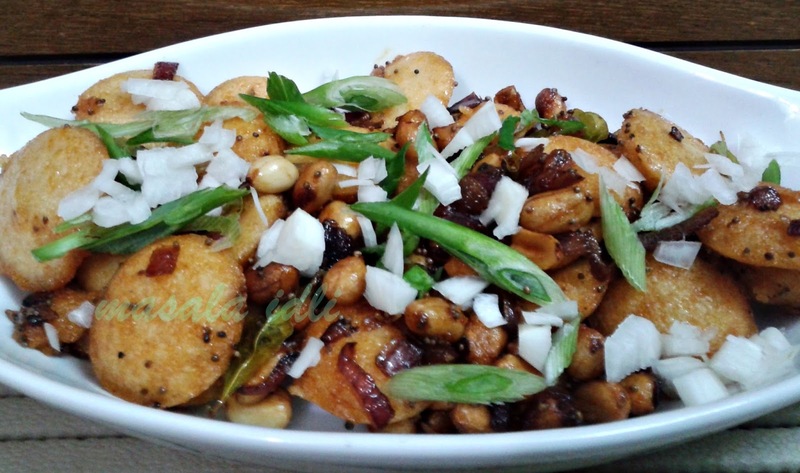 Garnish with dry fruits of your choice and serve hot.I have garnished it with caramelized walnuts. To caramelize walnuts heat 1/2 tsp butter and add 1 tsp of sugar stirring continuously when it will start changing its color then add 1 tsp water and walnuts. If you will try to evaporate whole of the sugar syrup by cooking the seviyan will become hard as the sugar will get caramelized and make it hard or chewy. 1. Heat ghee in a kadahi over low heat. 2. Add the flour and cook on medium flame stirring occasionally till it becomes brown in color,and leaves ghee. Do not over cook it may give a burnt smell. 3. 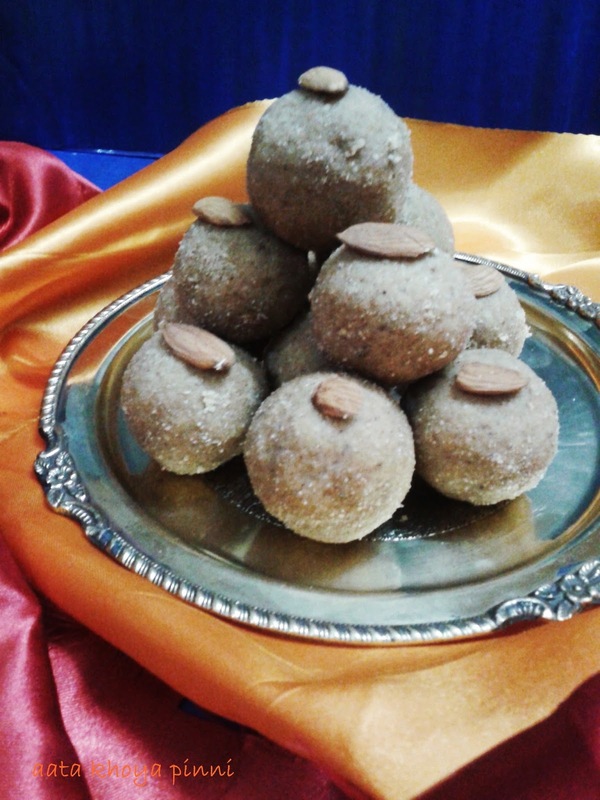 After the flour is cooked, add dry fruits of your choice and mix well. 4. Add khoya , but first cook it over low heat in a pan with a table spoon of ghee till it leaves the sides of the pan or you can do it in microwave also. 5. Turn off the heat and add the bura sugar after sieving it with the help of a stainer and mix well.Check for the sweetness if you like you can add more sugar as per taste. 6. After the mixture gets cool, take a small amount of the mixture in your hand and press it tightly to make balls of desired size. 7. Place the pinnies in open till they are completely cool.Then you can store them in a container. In winters these pinnies can be stored for a month even.You can eat pinnies when they are cool but if you like you can heat them in microwave and eat warm pinnies. If you are cooking khoya in a microwave then the time it will take to get dry will depend on its consistency, if it is almost dry then it will take 3-5 minutes otherwise you will need to cook it for more time, you will need to stir it in between otherwise it will be spoiled. 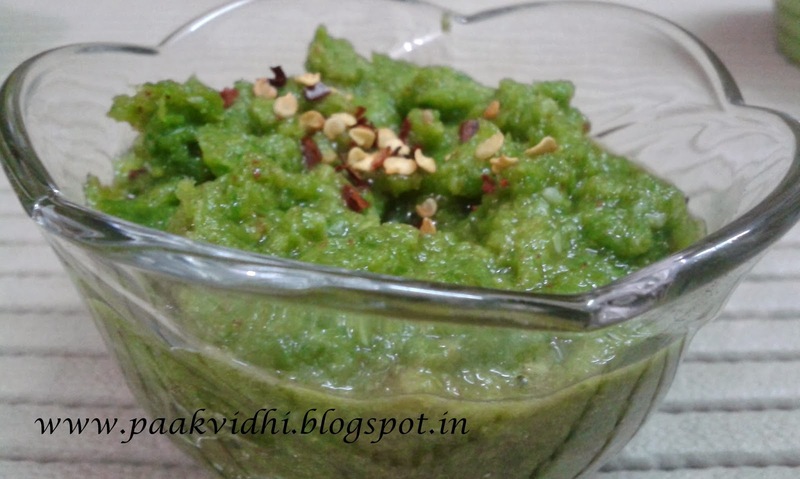 I feel it is better to do it in a kadahi and it is really necessary to cook khoya otherwise the pinnies will start giving foul smell after 3-4 days. 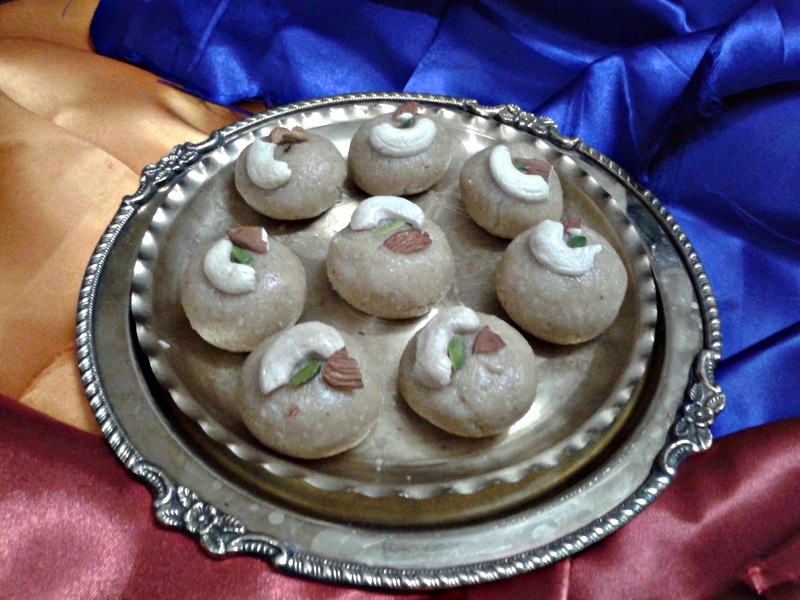 You can make pinnies without khoya also if you are doing so then reduce the quantity of sugar and increase the quantity of ghee.